Although people have been fighting for a long time for better rights for working mothers, maternity care is still limited for many insured workers. New statistics from 2009 suggest that the situation can be pretty bleak even for insured women trying to bring another person into the world. Two-thirds of participants in both fee-for-service health care plans and health maintenance organizations had coverage specified for maternity care, with almost all of the remaining third in plans in which the benefit was not mentioned. The extent of coverage between the two types of plans varied considerably. Fee-for-service plans, for example, were more likely than health maintenance organizations to cover maternity care subject to plan limits (55 percent versus 32 percent). Health maintenance organizations were more likely to cover maternity care in full than fee-for-service plans (16 percent versus 4 percent). The vast majority of workers with coverage were in plans that imposed some type of limitation (58 percent out of the 66 percent with coverage). 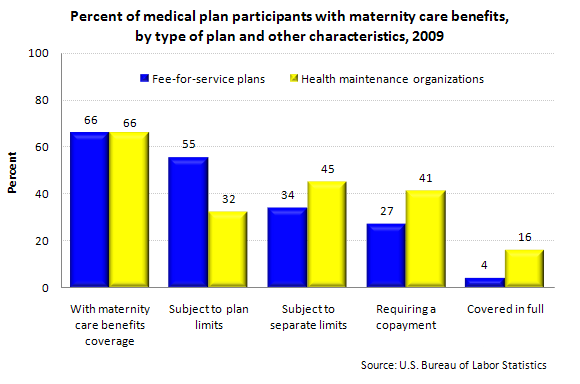 Maternity care was most likely to be subject to either plan limits or both separate limits and plan limits. When there were separate limits on maternity care, it was usually in the form of a copayment per visit. The median copayment was $20, with amounts generally ranging from $10 to $40 per visit.